Encouraging reverse mentoring through which women mentor men at all levels in tech organisations. An overview of work on the use of mobiles for sexual harassment by Bushra Hassan (International Islamic University, Islamabad). TEQtogether is committed to take forward actions that will make a difference to all of the above, through its guidance notes and future workshops. Working together, we can all contribute to the empowerment of people with disabilities (details of some of the UNESCO Chair in ICT4D’s activities and resources supporting people with disabilities). TEQtogether workshop on Changing men’s attitudes and behaviours to women & technology, with the New York Academy of Sciences and Global Scribes, Thursday 11th April (H2, 14.30-16.15) as part of our contribution to EQUALS. Please do join us for these sessions. We intend to try to make them as interactive and participatory as possible! ITU and UNESCO Chair in ICT4D session at WSIS Forum 2018: International decision-making in ICT – where are the women? The ITU is strongly committed to achieving gender equality across its organisational structures, and has been one of the driving forces for achieving gender equality in and through ICTs across the world, not least through its involvement in creating the EQUALS initiative. One of the key international gatherings convened by the ITU has been the series of World Radiocommunication Conferences held periodically to reach international agreements on Radio Regulations, with new and revised Resolutions and Recommendations. Traditionally, these have been very male dominated, and the ITU has therefore taken steps to encourage greater involvement of women at all levels in its decision-making processes. One aspect of this has been the creation of the Network of Women for WRC-19 (NOW4WRC19), led by Dr. Hanane Naciri, which aims to encourage increased participation of women in the conference being held in 2019. Its main objectives are to have a better gender balance among delegates, to prepare women for key roles in WRC-19, and to grow the women’s community capacity and contribution. As part of this process, the ITU and the UNESCO Chair in ICT4D convened Session 113 at the WSIS Forum 2018. This began with a lively panel discussion, opened by Dr Hanane Naciri (Radiocommunication and Software Engineer, Radiocommunication Bureau, ITU), with Sahiba Hasanova (Vice-Chairman, ITU-R Study Group 4 / Leading Adviser, Ministry of Transport, Communications and High Technologies, the Republic of Azerbaijan), Caitlin Kraft-Buchman (CEO/Founder Women@theTable, Geneva, Switzerland) and Brigitte Mantilleri (Director of the Equal opportunities office of the University of Geneva). The speakers shared some of their experiences of leadership in the field of ICT, commented on the challenges facing women who wish to participate in such events, and suggesting what needs to be done to involve more women at all levels in such processes (summary). Recognising it may not happen overnight: given how slow change has been so far, we need to recognize it may not happen swiftly, but we must develop the momentum so that it will happen as quickly as possible. Participants were committed to supporting EQUALS and working with the ITU to ensure that there is much greater involvement of women at all levels in WRC-19. EQUALS is a global initiative committed to achieving gender equality in the digital age. Its founding partners are the ITU, UN Women, UNU Computing and Society (UNU-CS) institute, the International Trade Centre, and the GSMA, and Royal Holloway, University of London, is one of the first group of 25 partners for the initiative. We were delighted that the Principal of Royal Holloway, Professor Paul Layzell, was able to attend the first Principal’s meeting in New York during the UNGA in September 2017 (image to the right). There are three Coalitions within EQUALS, for Skills (led by GIZ and UNESCO), Access (led by the GSMA) and Leadership (led by the ITC), and these are supported by a Research Group, led by the UNU-CS. 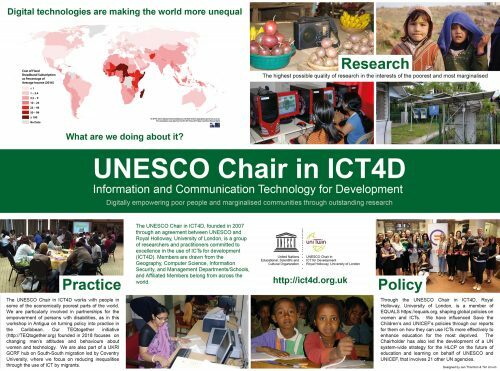 The UNESCO Chair in ICT4D has been very active across all areas of EQUALS’ work since its original conception during the discussions held at the WSIS Forum in May 2016, and has been particularly involved in contributing to the work of the Skills Coalition. The first face-to-face physical (rather than virtual) meeting of the Research Group was convened by the UNU-CS in Macau from 5th-6th December (official press release), and it was great that the UNESCO Chair in ICT4D could be represented by both Liz Quaglia and Tim Unwin at this meeting. This week’s gathering brought together researchers and policymakers from 21 organizations around the world. It established the group’s research agenda, drafted its work plan for 2018, and finalized the content and schedule of its inaugural report due to be published in mid-2018. In particular, it provided a good opportunity for researchers to help shape the Coalitions’ thinking around gender and equality in the three areas of skills, access and leadership, and also to identify ways through which they could contribute new research to enable the coalitions to be evidence-led in their activities. Huge thanks are due to Araba Sey, who convened the meeting with amazing enthusiasm, insight and professionalism, and all of the other staff at UNU-CS who contributed so much to the meeting. It was a great occasion when some of the world’s leading researchers in gender and ICTs could meet together, not only to discuss EQUALS, but also to explore other areas of related research, and to build the trust and openness necessary to increase gender equality both in the field of ICTs, and also through the ways that ICTs influence every aspect of people’s lives. The UNESCO Chair in ICT4D was delighted to represent Royal Holloway, University of London at the first Focal Point meeting of the EQUALS initiative held on the side of the UN High-Level Political Forum in New York on 18th July 2017 . EQUALS is a global initiative founded by the ITU, UN Women, the ITC, GSMA and the UNU, and delivered by a partnership of more than 20 corporate leaders, governments, non-profit organizations, communities and individuals around the world working together to bridge the digital gender divide – by bringing women to tech, and tech to women. Royal Holloway, University of London, was created from two of the leading women’s university institutions in the UK: Bedford College founded in 1849 as the first women’s higher education institution in the country; and Royal Holloway College, founded in 1879, also as an all-women College. The wealth of expertise of Royal Holloway, University of London’s researchers and teachers, especially those involved in the UNESCO Chair of ICT4D in fields such as information security, business management, computer science and geography, is highly relevant to the EQUALS agenda of enabling gender equality in the digital age. The Chair is also one of the first 20 research organisations committed to working as part of EQUALS Research Group led by the UNU-Computing and Society Institute, and looks forward to participating actively in the group. Leadership: Promoting leadership opportunities for women in the digital workforce including women’s entrepreneurship. Despite all of the global initiatives undertaken so far to use technology to empower women, digital inequality has increased. As UNESCO reported in March 2017 “the global Internet user gender gap grew from 11% in 2013 to 12% in 2016, with the estimated gap highest in Least Developed Countries (LDCs) (31%) and Africa (23%). Moreover, Internet penetration rates remain higher from men than women in all regions of the world”. EQUALS aims to use new approaches to reverse this trend, ensuring that women across the world have the access, skills and leadership to enable them to benefit from ICTs to the same extent as do men. Thanks so much to everyone who contributed to our workshop this morning at WSIS 2017 in Geneva on what we need to do to ensure that the poorest and most marginalised can indeed be empowered through the use of ICTs. Members of the UNESCO Chair in ICT4D are delighted to be participating in the 2017 WSIS Forum being held in Geneva from 12th-16th June. We are very pleased to congratulate one of our Honorary Patrons, Hon. Jean Philbert Nsengimana (Minister of Youth and Information and Communication Technology, Rwanda), who was elected Chair of the WSIS Forum 2017. Special SDG9 Session Co-hosted by International Telecommunication Union (ITU) and United Nations Industrial Development Organization (UNIDO) (Session 266): Digital Transformation for Sustainable Development (Room 1, CICG, 9.40-10.45 Thursday 15th June). We very much look forward to seeing friends and colleagues at these sessions. Copies of Tim Unwin’s new book, Reclaiming Information and Communication Technologies for Development will also be available at a special WSIS rate during our session on Friday. To coincide with the recent publication of Tim Unwin’s new book entitled Reclaiming Information and Communication Technologies for Development (Oxford University Press, 2017), the UNESCO Chair in ICT4D is convening a workshop on Friday 16th June (11.00-12.45 in Room Popov 1) at the 2017 WSIS Forum being held in Geneva. The key premise of the workshop is that the global spread of ICTs has increased inequality, and that the poorest and most marginalised have therefore failed sufficiently to benefit. The workshop will explore whether the continued focus on the ways through which ICTs can contribute to economic growth will inevitably lead to ever increasing, and dangerous, inequality, and will make recommendations as to how different stakeholders can best ensure that the poorest and most marginalised can indeed benefit from their use. Following these short, and undoubtedly provocative, presentations there will be an open discussion focusing on participants’ thoughts as to what are the most important priorities for action that different stakeholders must take so that the poorest and most marginalised people and communities can indeed be empowered through the use of ICTs. The workshop is open to everyone with interests in ways through which ICTs can indeed benefit poor people, and there will also be an opportunity after the workshop for participants to purchase copies of Reclaiming Information and Communication Technologies for Development at a 40% reduction from list price. We very much look forward to seeing you in Geneva at the 2017 WSIS Forum. Members of the UNESCO Chair in ICT4D participated in the ITU’s World Radiocommunication Seminar 2016 (WRS-16) held in Geneva from 12th-16th December 2016. This provided an excellent opportunity to gain detailed updated information on both terrestrial and space services, covering technical and regulatory issues including publications, databases and tools for countries to use in managing radiocommunications. the role that ITU should play in supporting this type of action. As well as participating in the formal aspects of WRS-16 this was also an excellent opportunity to engage with national delegations and participants, especially from Pakistan and Kenya, as well as officials and friends in the ITU to discuss how the UNESCO Chair in ICT4D can further contribute to the ITU’s activities. The UNESCO Chair in ICT4D featured prominently at the ITU’s Telecom World 2016 held in Bangkok from 13th-17th November, and was a partner of the ITU’s parallel Kaleidoscope academic conference held on the theme of ICTs for a Sustainable World. Three PhD alumni took an active part in the event: Salma Abbasi (Chairperson and CEO of the e Worldwide Group) who participated especially in connection with her ongoing work on ICTs for development in Nigeria; Sammia Poveda (UNU Computing and Society), who represented UNU-CS primarily in several gender-related events, especially the EQUALS working meeting and the joint session on the gender dimension in international standardization; and Caitlin Bentley (Research Associate at the Singapore Internet Research Centre at Nanyang Technological University) who represented both her present Centre and the UNESCO Chair at Kaleidoscope. Joint Forum-Kaleidoscope session on Making money from the SDGs? The first working group meeting of the EQUALS Global Partnership for Gender Equality in the Digital Age (a partnership between the ITU, UN Women and Whurley), where the Chairholder led the Skills Coalition session. The joint session between the ITU Forum and Kaleidoscope on the gender dimension in international standardization. This was a great opportunity for colleagues in the UNESCO Chair in ICT4D to engage in discussions with those in government, the private sector, civil society and international organisations and to influence policy on ways through which ICTs can contribute to development, especially for some of the world’s poorest and most marginalised. We are most grateful to colleagues at the ITU for making this possible, and for inviting our participation at ITU Telecom World 2016. Thanks to the ITU’s official photographer for most of the above images! Job Creation” in advance of the WTDC meeting in Buenos Aires in October 2017 http://www.itu.int/net/events/eventdetails.asp… . This was explored in some detail over two days in September at a fascinating discussion convened in Geneva. I have been invited to lead on a 6,000 word chapter, provisionally entitled “Sustainability in Development: Critical Elements” that has an initial summary as follows: “the chapter identifies how ICTs engage with the sustainability agenda and the various elements of the ecosystem (such as: education, finance/capital, infrastructure, policy, market, culture/environment, opportunities) and the stakeholders that are indispensable for ensuring resilient and sustainable development activities in developing countries in spite of some chronic shortages coupled with fast changing and fluid situations that can negatively hamper the efforts”. I want this chapter very much to be a collective, bottom-up effort, and am exploring various collective ways of generating content – although this is hugely difficult given the tight word limit! At this stage, it would be great to receive suggestions as to (a) what content the chapter should focus on, and (b) examples of case studies of successes and failures with respect to the use of ICTs for sustainable development. Please share any thoughts with me – before the end of September! For those who may be unfamiliar with my own critical comments on the linkages between ICTs and the SDG agenda do see https://unwin.wordpress.com/…/icts-and-the-failure-of-the-…/, and on the abuse of the term ecosystem https://unwin.wordpress.com/2014/03/16/icts-and-ecosystems/ . Rest assured, though, that the chapter for the ITU will reflect very different perspectives, and I hope that it will indeed represent the interests and concerns of the wider ICT4D community.